"Your team is headed to Super Bowl LII and you could too! 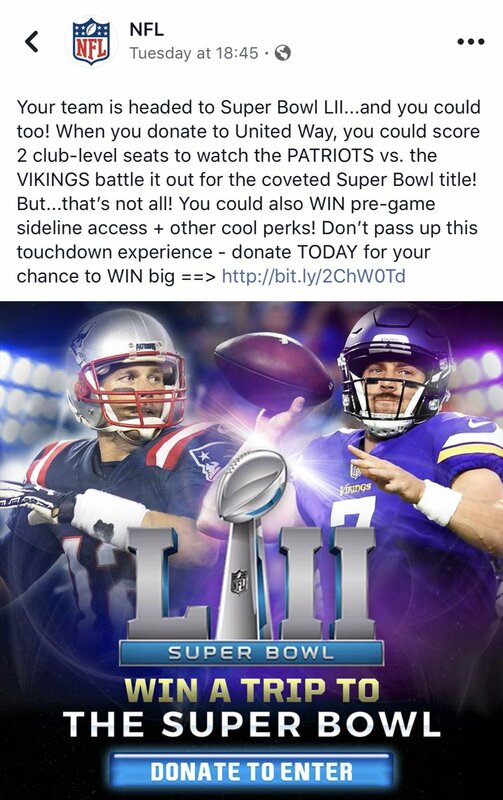 When you donate to United Way, you could score 2 club-level seats to watch the PATRIOTS and the VIKINGS battle it out for the coveted Super Bowl title! But...that's not all! You could also WIN pre-game sideline access + other cool perks! Don't pass up this touchdown experience - donate TODAY for your chance to WIN big ==> http://bit.ly/2ChW0td"
Wonder if that pre-game access includes deflating Tommy's balls?